Microsoft products are now only available through Microsoft Azure Dev Tools for Teaching. After completing the signup using your JAMK credentials, you can browse available software (possibly) under Home -> Education -> Software. VMware products are still available through Kivuto Webstore. There’s an ongoing problem with our Internet connection on the operator end (a cable break between Jyväskylä and Tampere.). Issue started at 10.19. This issue causes name resolution to return an incorrect IP Address for forementioned services even when a full tunnel is forced. This is due to smart multi-homed name resolution and automatic interface metrics. LabraNet VPN guide has been updated with step-by-step instructions on how to fix this. Read Windows 10 – Additional settings for more info if this is an issue for you. 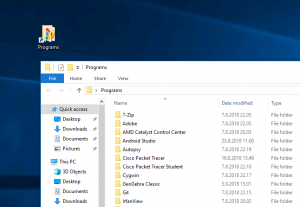 If even the Programs -shortcut is missing from the Desktop, software can be found in C:\Program Files or C:\Program Files (x86) -folders manually. On new installations, waiting for a period of time (15 minutes) and signing out/in can help also. To ease the pain of Mac users LabraNet-wide, LabraNet Remote access guide has been updated. Additional documentation has been provided for L2TP/IPSec VPN for Mac OS users and documentation related to iSstp has been removed. As a reminder, the old VPN-service vpn.labranet.jamk.fi has been shut down. Please use the new server at sslvpn.labranet.jamk.fi. Instructions for using the new server and connection are available here. The Institute of Information Technology has updated its usage policy for its networks and systems. You can read policy here (requires LabraNet authentication).